It was only a week ago that the movie trailer for The Amazing Spider-Man 3D has been released and yet it already got more than four million hits on YouTube, not counting the hits on those who re-uploaded the trailer on their own channels. The movie trailer gives us a wider glimpse of the story that the first movie of the new Spider-Man trilogy is going to take. This new Spider-Man series is topbilled by Andrew Garfield and directed by Marc Webb. The Amazing Spider-Man 3D movie tells the story of Peter Parker (Andrew Garfield) as teenager who is an outcast from high school and abandoned by his parents when he was young. He is now living with his Uncle Ben (Martin Sheen) and Aunt May (Sally Field). He spends his days trying to unravel the mystery of his own past and winning the heart of his high school crush, Gwen Stacy (Emma Stone). Gwen Stacy is a key character in this movie, unlike in the previous Spider-Man series where Peter Parker's love interest is Mary Jane Watson. Spider-Man fanatics would argue that it is actually Gwen Stacy who is Peter Parker's first love and not Mary Jane Watson. As the film continues, Peter discovers a mysterious briefcase belonging to his dad which leads him to his dad's former partner, Dr. Connors (Rhys Ifans). The discovery of his father's secret will ultimately shape his destiny of becoming "Spider-Man" and bring him face to face to Connor's alter ego, the Lizard. Below is the popular Amazing Spider-Man 3D movie trailer which features Andrew Garfield wearing the more-defined Spider-Man suit. When he's not in his suit, he's talking to Gwen Stacy with his blown-away hairdo. Then he discovers the real identity behind the Lizard, which, by the way, will be gracing the big screen for the first time. Watch the movie trailer of Amazing Spider-Man 3D below. 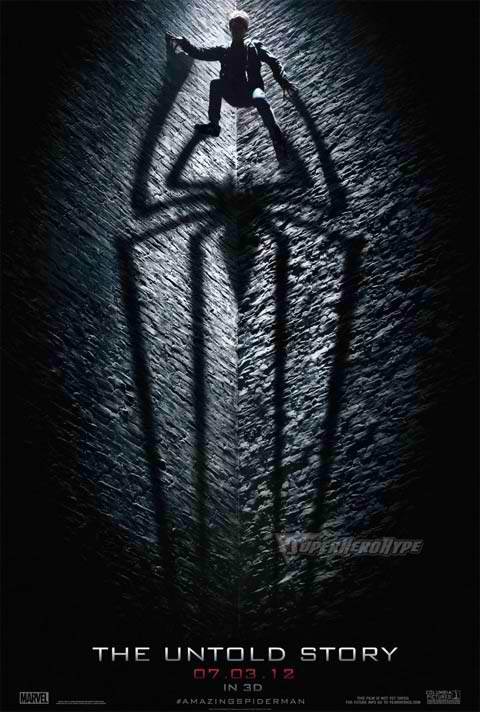 The Amazing Spider-Man 3D opens July 3, 2012.